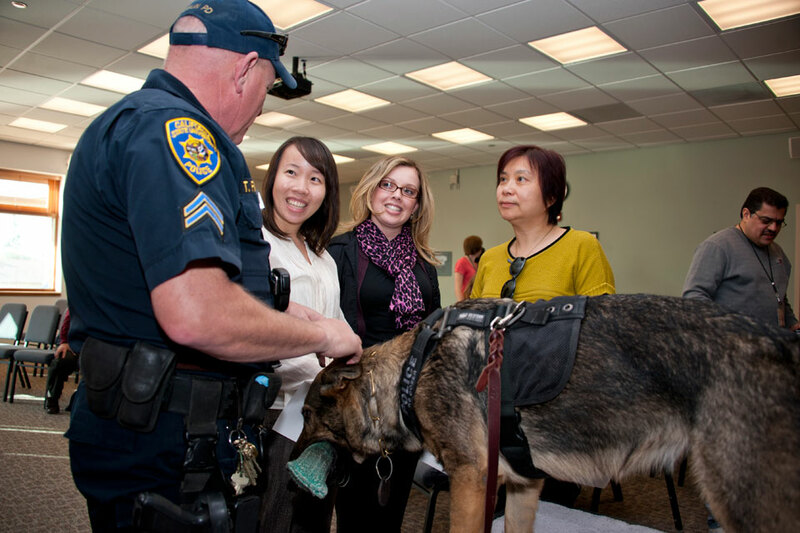 On Feb. 13, 2013, the California State University, Northridge Department of Police Services invited the CSUN community and neighbors to meet the department's K-9 unit. The two-hour event—which was attended by 73 people—was a fundraiser for the care and maintenance of the K-9 dogs, Isy and Mitch. Donations were accepted and T-shirts were sold to support the police pooches (there are only a few shirts left, but more are being ordered). The DPS is still accepting donations, so to make a contribution or buy a T-shirt, you can go to the Department of Police Services building. Shown here, Ly Hoang and Cynthia Roseman from the financial accounting office, and Shen Mulunovic from student accounting meet Cpl. Tom Finnerty and his partner, German shepherd Isy. Photo by Lee Choo. 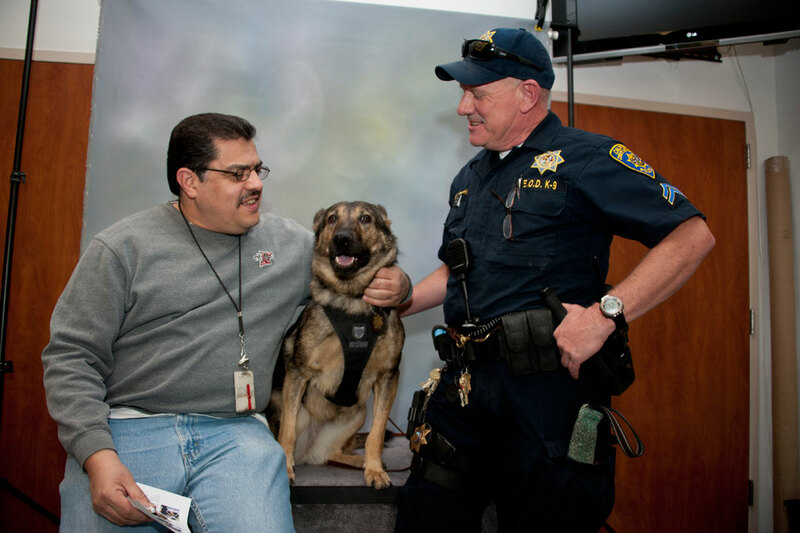 CSUN IT operations specialist Manny Gonzalez sits for a photo with German shepherd Isy and Cpl. Tom Finnerty. Photo by Lee Choo. Officer Felix Anthony Vargas (left) talks to the crowd with Mitch while Cpl. 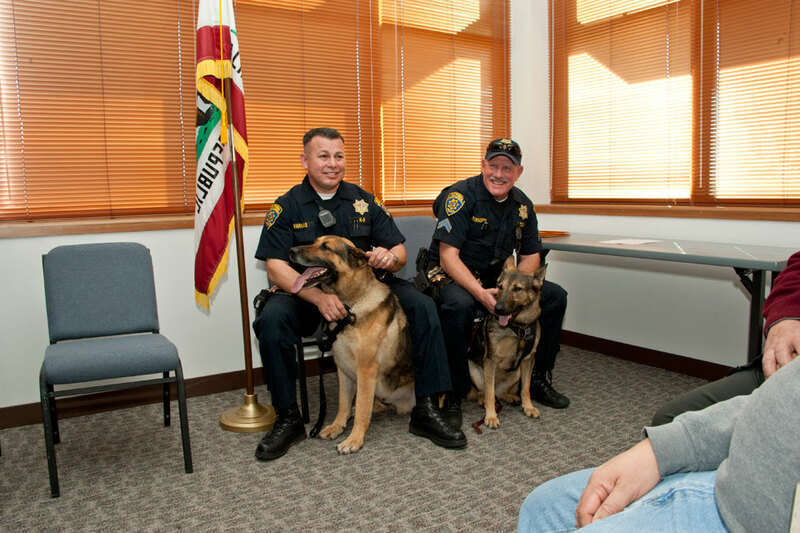 Tim Finnerty (right) watches with his K-9 companion Isy. Photo by Lee Choo. 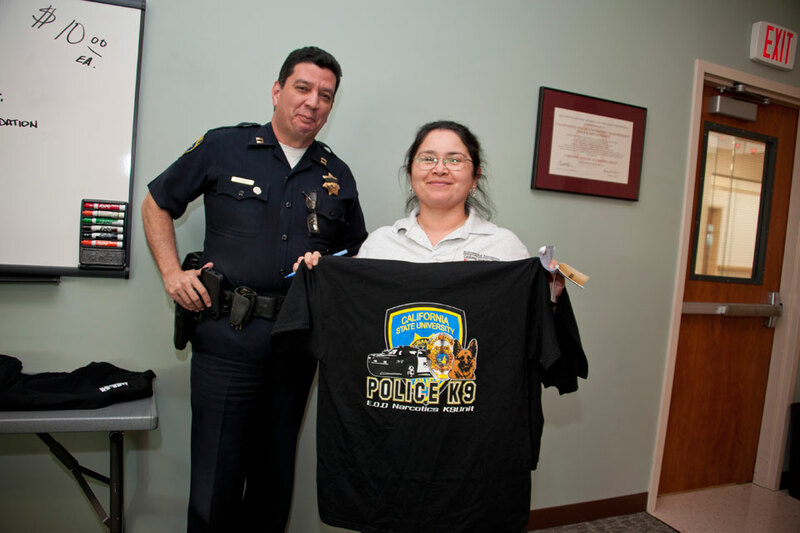 Claudia Garcia, an information tech consultant from the College of Business and Economics, holds up one of the shirts alongside Capt. Alfredo Fernandez, who oversees the K-9 unit. Photo by Lee Choo. 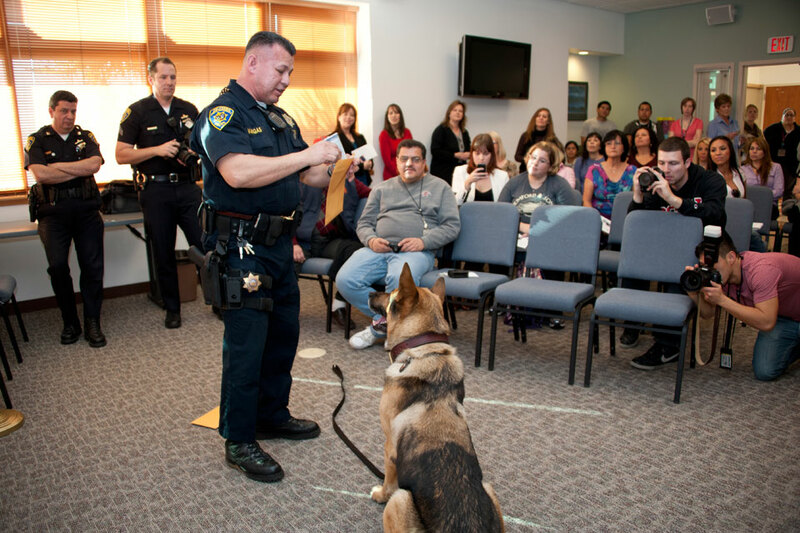 Officer Felix Anthony Vargas (center) and his K-9 companion Mitch display some of their techniques while K-9 unit commander Capt. Alfredo Fernandez (far left) and Cpl. Leon Ortiz-Gillook look on. Photo by Lee Choo. 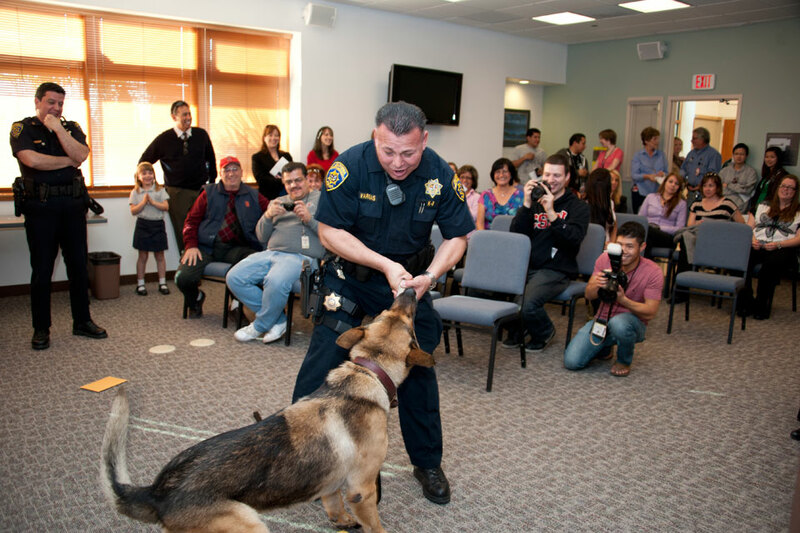 Officer Felix Anthony Vargas (center) and his K-9 companion Mitch display some of their techniques while K-9 unit Capt. Alfredo Fernandez (far left) looks on. Photo by Lee Choo. 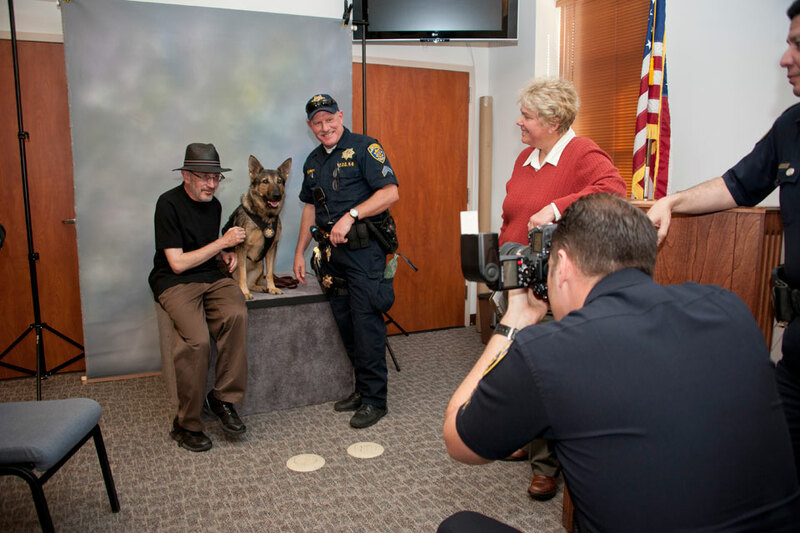 CSUN Provost and Vice President for Academic Affairs Harry Hellenbrand is photographed next to Isy, the K-9 companion of Cpl. Tom Finnerty. Photo by Lee Choo.